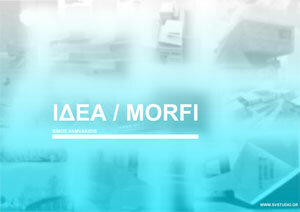 The Department of Architecture and Interior Design is hosting a lecture entitled “MORFI” conducted by Yerasimos Vamvakidis. Yerasimos Vamvakidis began studying mathematics at the University of Athens, but soon changed his path towards obtaining a bachelor’s degree in civil engineering (TEI of Piraeus) and a diploma in architectural engineering from the National Technical University of Athens (NTUA). He was awarded the Fulbright and Mihelis scholarships prior his master’s at the University of California in Los Angeles (UCLA, MArchII) and the Onassis Scholarship for his PhD at NTUA, School of Architecture. He has worked on the design & construction of public and private spaces and buildings in Los Angeles and Athens and has been awarded in international architectural competitions. He has taught at the NTUA School of Architecture (2008-2011) as a lecturer“407”and as a PhD candidate, focusing on digital & parametric design and computer aided manufacturing (CAM) technologies. He is currently a visiting assistant professor at LAU, Byblos.